Peripheral arterial occlusive disease is a condition that causes the blood vessels to narrow. A peripheral stent is used primarily to expand narrowed vessels from the inside and support them as they heal. The stents that are currently on the market are mostly metal, so once such a stent is placed in a vessel it will remain there throughout the patient’s lifetime. The REMEDY™ biodegradable (peripheral) stent was developed to unblock blood vessels in the lower extremities, and the REMEDY™ stent is based on the rationale that a stent should be “a biocompatible medical device that leaves no foreign materials in the body.” Once the REMEDY™stent is placed in a vessel, it is covered by endothelial cells inside the vessel after several weeks. After a certain amount of time, the stent has served its purpose (supporting the vessel), so it gradually breaks down into water and carbon dioxide. Thus, no foreign materials are left in the body. 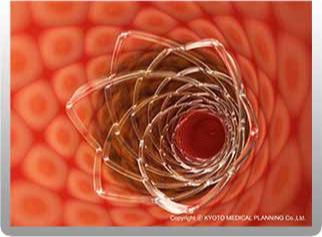 KYOTO MEDICAL PLANNING successfully commercialized the REMEDY™ biodegradable peripheral stent in 2007. Currently we are developing an upgraded version of the REMEDY™ as well as a drug eluting stent based on this stent. Feel free to have a look at an animated clip in a format supported by Windows Media Player (.wmv). Once you click on the link below that best suits the speed of your Internet connection, the clip will begin playing in a new browser window. 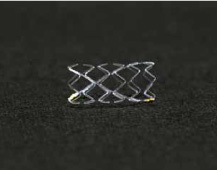 Have a look at the IGAKI-TAMAI® STENT here.